Can you point me to those studies? All I have been able to find is that vitamin B-12 complex is utilized by bees but nothing on any other vitamins (except C). I've found nothing at all about electrolytes. Nor about probiotics. In fact, I was under the impression that lactic acid isn't good for them! Shows how much I know! So any studies that will help me sort this all out will be greatly appreciated. edited to add that I rediscovered this thread among my links and I'm busy reading! It never ceases to amaze me how much about bees some of us know AND ARE WILLING TO SHARE! Thank you, Michael Bush et al! 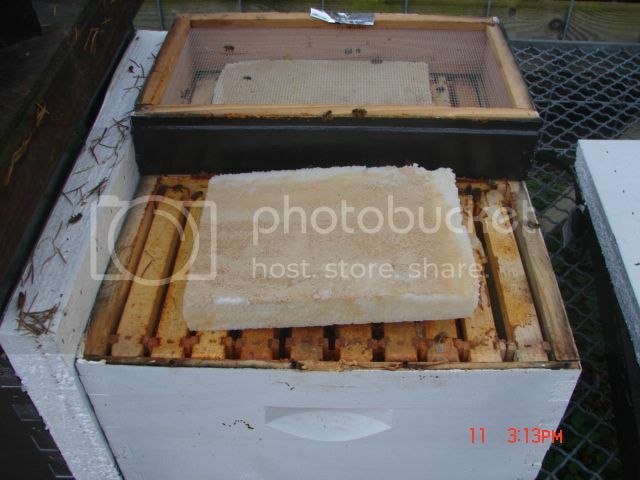 Here another one not sure where I got it but if you search the title in google you will find it "IMPROVEMENT OF THE COMPOSITION OF POLLEN SUBSTITUTE FOR HONEY BEE (Apis mellifera L.),THROUGH IMPLEMENTATION OF PROBIOTIC PREPARATIONS"
I have 2) nucs that are too light going into winter. Last fall I made candy by heating water and sugar and the block came out really hard. The bees ate it, but I wasn't crazy about the process. After seeing Lauri's post I decided to give it a try. I made up 2) 3/4" shims for the nucs. Then I made the sugar mix using 2) 4 lb bags of sugar and 1/3 quart of AC vinegar. I ordered the vitamins Lauri recommends, but did not use it as I had a small window of good weather to deal with. I did add a little pollen substitute to the mix. I may include some HBH in the next batch, but omitted it on this batch so as not to set off robbing. I placed a shim on a bread pan, added the mix and used a rolling pin to compress. I sliced the cake into 3 bricks and gently removed the shim. They were placed into the oven at 170 degrees for a good 5 or 6 hours. Two bricks broke as they were not dry on the bottom, so I gave them a few more hours. Four bricks remained intact and came out perfect. I really like the consistency of these bricks compared to the hard candy from last year. The whole process was quite easy, and a 4 lb bag of sugar is perfect for a nuc...you'll get 3 bricks of a perfect size since you're using the shim as a mold. I actually only used 2) bricks per nuc. The only thing I will do differently next time is to put the wet bricks on a cake cooling rack while in the oven so they will dry out more evenly and faster. My full size hives I got up to 130 lbs this fall, so I might not need the candy, but last week the lows were 19 degrees...today it got up to 70 degrees so it looks like we're in for another quirky winter. Thanks for sharing, Lauri...I'll let you know how they like it! Here's a picture of a broken brick. Belewsboy, wait three weeks you may get the chance to use those vitamins. I have one nuc that used up 3 lbs of sugar in 3 weeks. I only have a few hives. Have you made smaller batches? Have you checked the pH level? Last edited by DJW; 11-20-2013 at 10:04 AM. I'll let you know how it turns out, I only have 1 &1/2 hives meaning not sure if I'll have enough bees in my second hive. I made mine with a 4 pound bag of sugar & 1 cup of Bragg vinegar about 1/8 teaspoon of the electrolytes Lauri recommended and about 1/2 teaspoon of dry pollen. I'm going to put it in the oven around 11:00pm tonight on my warm setting and look at it tomorrow morning around 7am that will be around 8 hours. Not sure if i did something wrong, my setting was around 150. Been in oven over night about 8 hours, i checked and still liquefied in areas. Not sure if it comes out of the oven this way or needs to stay in longer. I set my temp to 200 and ill check in an 1/2 hour to see if it changed at all. Reading all the post again I say I made the mistake in adding to much vinegar, my mixture was sticky and from what Lauri posted "Mixture will feel very soft, but not wet or sticky." Last edited by herbcoop; 12-15-2013 at 05:57 AM. After mixed, it should be like snow..kind of crunchy but slightly moist. I baked mine at 170 for a couple of hours. I found they harden up after they come out of the oven in the cool down process. I put parchment paper on my cookie sheets. Makes it easier to get bricks off the sheet. Lauri recommended and about 1/2 teaspoon of dry pollen. I sometime sprinkle dry protein on top, but not in the mix. (Don't feed them solids if they can't get out for regular clensing flights) By sprinkling on top they can take it or leave it-their choice. Here is how one of my very smallest mini nuc colonies faired after our 10 days of very cold weather. After 10 days very cold temps..a few days in the single digits-wind chill temps below 0, I went straight out to my smallest mini nuc and took a peak. Temps today reached about 45 degrees, just enough so I could crack the insulated inner cover and take a pic and glance. These were late mating nucs with a virgin introduced early August. Only on 4 -5 half sized deep frames with outside frames being totally empty, foundation only. I left them this way just to see if they would overwinter on a colony that small, in a not so perfect interior. I was glad to see they looked great. I was surprised to see how much of the sugar block they had consumed. Placed directly over the cluster, it gave them the feed they needed with out forcing them to break the cluster move. (Although these had nothing to move to) Placing frames of honey over the cluster would have given them too large an interior. When I get a day that is above 50, I will push the remaining sugar block together in the center over the cluster and will plan to replace it in a few weeks. All my colonies in singles-from 10 standard frames to these small ones got a brick. 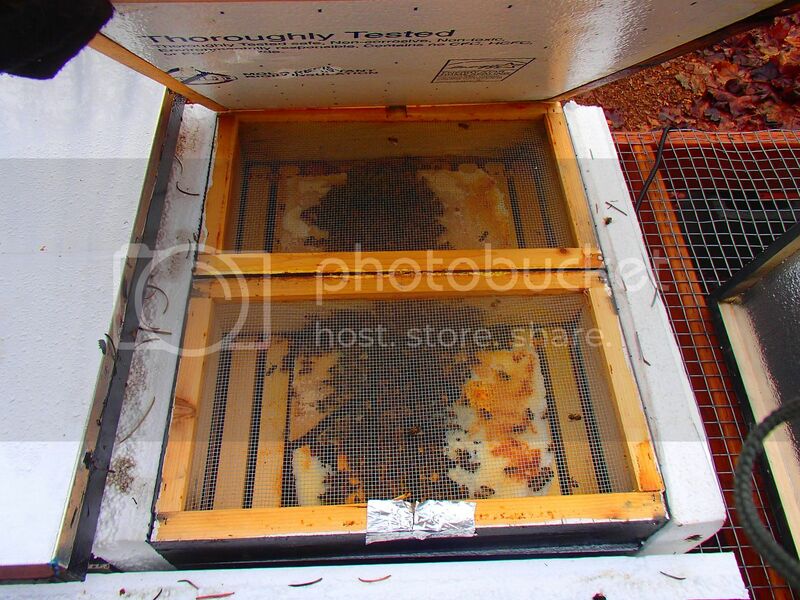 No need to move to feed within the hive, easy feed source directly above the cluster. Condensation collects on the sugar and makes it available to them in the form of occasional syrup droplets. Seeing those pics makes me think I better check mine on the next available day. They may go through this much faster than I expected. We've had bitter cold temps here in KS the last couple weeks. We where able to check on our hives yesterday. they are still goign on the feeding they got in November. the cold weather has slowed them down a bit. Thankyou Lauri! I checked my hives today as it was just warm and sunny enough for them to take cleansing flights and some need more sugar bricks...will be cooking up a storm tonight, using your recipe! I found an easier way and I like easy. Just add 1 pt of water to a 10# bag of sugar ,scale up as you like, and mix til all sugar, water and your other additives are mixed into a sludge. I put the sludge into Dixie placticized soup bowls that hold about a pound and a half. I carefully invert the packed moist sugar and let it dry into a sugar brick or if I don't make them ahead, just invert them wet onto top bars over cluster. I just made some bigger ones up by putting 5# of the sludge into a doubled newspaper and folding it into a square. I bet the bees will get rid of the paper and it will be less messy to handle. OK, I got it to work tonight... Way to much vinegar last time. The only problem I encountered tonight was from my wife and 16 year old daughter saying the next time I plan on doing this will be on a Saturday morning or a day off from work and they will be gone all day so I can air out the house "LOL"
If you use a bit of Lemongrass oil or Pro Health..your house will smell great! Lemon grass won't bring on robbing or any unwanted bees to the hive when I put the candy in? I know its used to attract and catch swarms? I don't think you need to worry about lemongrass oil attracting unwanted bees when it is added to sugar bricks. Robber bees would be far more likely to be attracted to established hives due to the honey in it than lemongrass oil. Also for this time of year you would not have a whole lot of foraging and robbing going on. I do not use smoke this time of year either. but timing is a consideration. I like it to be between 30 and 40 degrees. Even at that on a sunny day the bees may be active inside the hive. It makes it hard to add sugar wile the bees are crawling all over what is left. Keep in mind the sugar is right under the outer cover. I just lift the top pour in the sugar and close it again. you do not want to disturb or break up the cluster they are in. So very quickly in and out and no more than to put sugar at the top of the hive. Made a batch of this a few weeks ago, left it out to dry 1-2 weeks, formed nice little bricks. I made mine about 1/2 inch so I can fit above the inner cover (mason jar hole). Bees started to eat them before the lid was closed. Very easy to make, the last few years I've been cooking syrup to candy-- Never Again! I left the EO out I think the apple cider vinegar is more then enough to encourage the bees to eat them. Also I think the EO's might kill probiotics in the vitamins and electrolytes. Also no pollen for them yet. I made some bricks this week, and used 5 lb. sugar plus 3/4 cup of ACV. I didn't have citric acid, but I did have ascorbic acid. I placed about 1/2 of the sugar in the bowl of a stand mixer, added the ascorbic acid, started mixing and then added about 1/2 of the vinegar. Once the sugar was evenly wetted I added the remaining sugar, stirred for a little while more, then drizzled in the remaining vinegar while stirring. I couldn't locate my lemongrass oil, but figure that the ACV may provide enough stimulation. The whisk attachment on a stand mixer made this process a breeze, and the final consistency was like that of wet snow. It only took about 1 minute. I then lined some cake pans with the paper that comes in-between sheets of foundation and molded the mix into 1.5 inch thick blocks. I then 'frosted' the exposed face with some dry MegaBee. The bricks went into the oven at 200 for a couple of hours, and were allowed to sit overnight. Since it is baking season in my house, the pans go back into the oven after the oven has been used and is in the process of cooling down. So far, no vinegar flavorings to be had, though I did just now have an interesting idea for vinegar-flavored Grinch cookies. I will place a spacer on the hive when I introduce the bricks. This should happen at the end of the week, when temps are predicted to be in the low 50s after 2 weeks of freezing temps.